Here we are at the beginning of a brand-spankin’ New Year again! Well, so what’s it going to be: “same old thing” or “Let’s try to do it better this time around.”? How about accentuating the positive! For starters, as fishkeepers, it’s a given that we love our fish. As in many things; a little practical knowledge will boost our success rate in providing our wet pets with a happy, healthy life. When you’ve got your health – you’ve got everything – the same goes for fishes. So, one big necessity is always clean water. This is mainly because of the nitrogen cycle in which fish waste produces toxic ammonia. The nitrates that are eventually produced from the ammonia would recycle in nature, but in your aquarium a high nitrate level is harmful to fish. 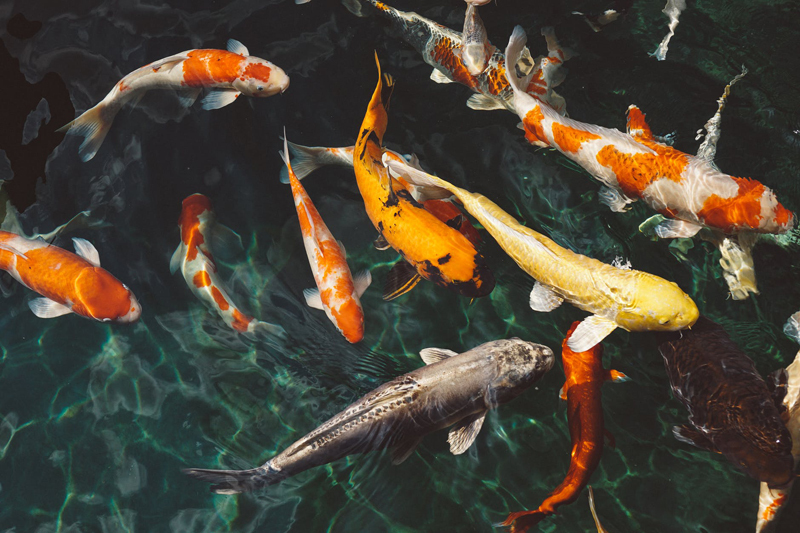 To prevent the diseases and eventual death of your fish from the build-up of nitrates from fish waste, you need to filter the water, change part of the water on a regular basis, and test your aquarium water. Equally important in maintaining water cleanliness is vacuuming the gravel. Depending on the size of your fishes’ homes – use anything from a turkey baster up to whichever size of siphon you need from the pet store. This prevents too much of that gunky stuff accumulating that comes from fish waste, plant fragment, and uneaten food that is decaying and will cause biological problems. Also, let’s resolve to have a “hospital tank”. This is a separate tank that should have a sponge filtration system, an air pump and stone, a heater, dim lighting, a small artificial plant, and no gravel. The hospital tank is useful in treating sick fish – most commonly used for the old-fashioned salt bath – which many experts swear by. This type of tank can also be used to keep your new fish in quarantine for two weeks before you put them in with your existing fish in their tank. Next, make plans to feed your fishies nutritiously! They love to eat, so, of course, it’s important not to overfeed them – since this can cause physical problems for them. On the other hand, variety is important and vow to give them treats and try some household foods and live foods that are appropriate for the type of fish you have. You can often get free information on the care and feeding of your specific type of fish at your local pet store. In addition to that, decorate your fish tank with plants, rocks, gravel, and toys! Your fish not only need clean, safe water; (Water to our fish is like air to us! ), but they also need a place to hide, to rest, and something interesting to look at. Before choosing any of the above, take into account the size and type of fish you have and the size of their living space. Sometimes they might like a change of scenery! Change the gravel, (The waste-absorbing kind is good! ), a silk or live plant is nice, (Some of the plastic ones have sharp edges that can cut fins – ouch! ), and there are numerous toys – from miniature divers to a flower pot for a cave! Let your imagination go wild and your fish will love you for it! Finally, check the overall ambience of your fishes’ home daily. Fish are sensitive to temperature, light, and sound. In general, maintain the optimal temperature for your fish, do not place your fishes’ habitat in bright sunlight because it will cause algae to grow quickly, and do not startle your fish with sudden, loud noises. These are factors that can cause stress on your fish and stress can cause disease. A fish journal and/or calendar is helpful to record all of the above and more – including any comments you’d like to record that you observe about your fish. Be sure to browse through the articles on the Fish Site at BellaOnline.com for more information on fish care. Join our Fish Forum and jump into the discussion and tell us your fish tales! A Happy and Healthy New Year to you all and to all your fishy friends!